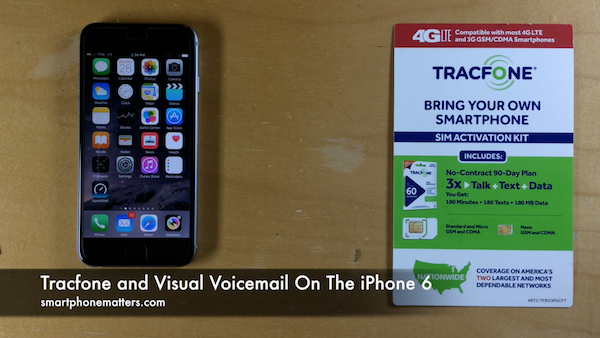 In this video I talk about voicemail and Visual Voicemail for the iPhone 6 using Tracfone. In my previous videos I showed you that I could send and recieve text messages and MMS picture messages as well as connect to the internet using cellular data with my iPhone using Tracfone Wireless. I signed up for Tracfone using a No Contract 90 Plan and their ATT GSM LTE Network using the nano SIM provided in the SIM Activation Kit. Now for voice mail. I do get voice mail on my iPhone with Tracfone, but not Visual Voicemail. I the video I show you that I’m able to dial into voicemail to listen to my messages, but I can manage messages using Visual Voicemail. So if your using the Tracfone ATT GSM LTE Network with your iPhone you won’t have Visual Voicemail. Now, If I signed up for Tracfone and had uses the Tracfone Verizon CDMA LTE Network I MIGHT have Visual Voicemail. In the summer of 2014, I published my Use an iPhone for $7 a month video. In that video I took a used Verizon iPhone 4s and transferred and existing tracfone account to that phone. It uses the Verizon CDMA network. That phone is still in use and visual voicemail is working. When I first signed up, it did had voicemail but not Visual Voicemail. Now I have never seen Tracfone advertise that they support Visual Voicemail, so if you sign up for their Verizon CDMA LTE network and Visual Voicemail doesn’t work I doubt you’ll have luck getting Tracfone to fix that for you. So what about you? Are you using Tracfone and an iPhone? Do you have Visual Voicemail? Leave a reply below and share? Hello! My iPhone 6 does not have the badge notification for voicemail with Tracfone. What is the seething for this, please? I’ve tried everything I’ve read on line but none worked. Tracfone supports regular voicemail, not visual voicemail.